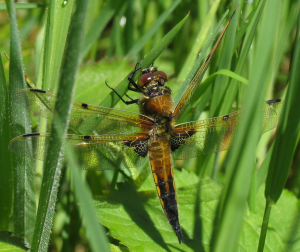 Observation - Dragonfly - Four-spotted Chaser - UK and Ireland. Description: Brown, tapering body with yellow sides and black tip. Spots at the middle of the wing edges in addition to the pterostigma. By forest stream. Brown, tapering body with yellow sides and black tip. Spots at the middle of the wing edges in addition to the pterostigma. By forest stream.